Several players, such as Thuraya and Iridium, recognize the importance of this narrowband need and continue meeting it in improved ways. For instance, the new Distributed Tactical Communications System (DTCS) is a government-managed system providing netted voice and data communications beyond-line-of-sight (BLOS) and over-the-horizon using the Iridium network. With the launch of Iridium NEXT, that companys second-generation constellation, the company will support enhanced and new services, according to its website. By way of another illustration, Thuraya offers dual mode handheld phones featuring GSM and satellite capabilities and is the only organization to do so, according to a press release. In addition to Iridium and Thuraya, there has been some attention in recent years given to the Ultra-High Frequency (UHF) band and the substantial investment by government and industry in UHF payloads and their associated radios and waveforms. UHF is the ultra-critical communications link designed for users at the tactical edge as well as for command and control reach-back. As the most robust BLOS satellite communications available, access to scarce UHF capacity is becoming increasingly important. However, the health and capacity of the current U.S. UHF satellite constellation is continuing to weaken and fewer circuits are available for military users. Waveforms such as Demand Access Multiple Assignment (DAMA), and now Integrated Waveform (IW) are used to effectively increase the capacity of a channel by allowing multiple simultaneous users to communicate on dedicated channels. Industry as well has invested in developing commercial waveforms. While these waveforms allow users to increase the use of scarce UHF resources, the U.S. Department of Defense additionally plans to mitigate the impending shortage and the weakening fleet by introducing a new satellite constellation called Mobile User Objective System (MUOS). The MUOS constellation will consist of five next-generation UHF satellites. After a 26-month delay, the first MUOS satellite was launched last winter. However, the MUOS waveform that is required to make use of these new capabilities has been delayed. When the MUOS waveform and certified terminals are fully developed, theyll enable increased BLOS capabilities, improving upon the capacity and throughput available today. 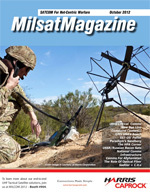 Despite the substantial increase in capacity and capability offered by MUOS, the demand for UHF satellite capacity still exceeds supply by more than 200 percent, according to some Government estimates. In light of this, several new commercial offerings are being launched this year to support the remaining UHF gap. For example, Intelsat General and Astrium Services have invested in multiple UHF payloads, two of which are scheduled to launch this winter. Furthermore, Harris CapRock recently joined Astrium Services in providing UHF solutions across the entire Skynet Fleet. As a global UHF channel partner, Harris CapRock is building a UHF service offering that will be made available in the spring of 2013, designed to leverage the well-established base of Harris Falcon radios. The service will include dedicated 25kHz and 5kHz satellite channels for use with any UHF Tactical Satellite (TACSAT) capable radios, including several prevalent Harris models such as its Falcon II® and Falcon III® product lines. Using a Harris UHF TACSAT waveform, users will be able to actively manage their channels without the need for expensive controllers. If users decide to set up a network with the Harris TACSAT waveform, they can quickly configure data and voice channels according to their mission requirements. The Harris waveform can provide as many as 11 voice channels or three voice channels and one high-speed data channel with a single 25KHz dedicated UHF TACSAT channel. The AN/PRC-117F is the actual Time Divisional Multiple Access (TDMA) controller and can act as such from anywhere within the satellite footprint. The UHF service also will support legacy UHF waveforms, such as DAMA and IW when using government infrastructure. No one would deny the importance of wideband communications as applications continue to drive growth and mobility continues to increase. Yet, reliable, mission-critical voice communications can be even more important to tactical users at the tip of the spear. The good news is that in addition to the MUOS and DTCS programs, companies such as Iridium, Harris, Intelsat and Astrium Services are developing new services to meet the growing needs and potential gap for this set of requirements. David Cavossa leads Harris CapRocks Government Solutions team and oversees the direction and growth of the business, which focuses exclusively on serving military and federal civilian agencies. With over a decade in the telecommunications industry, Mr. Cavossa has extensive experience supporting the government community in both the public and private sectors. Additional information is available at the Companys website.